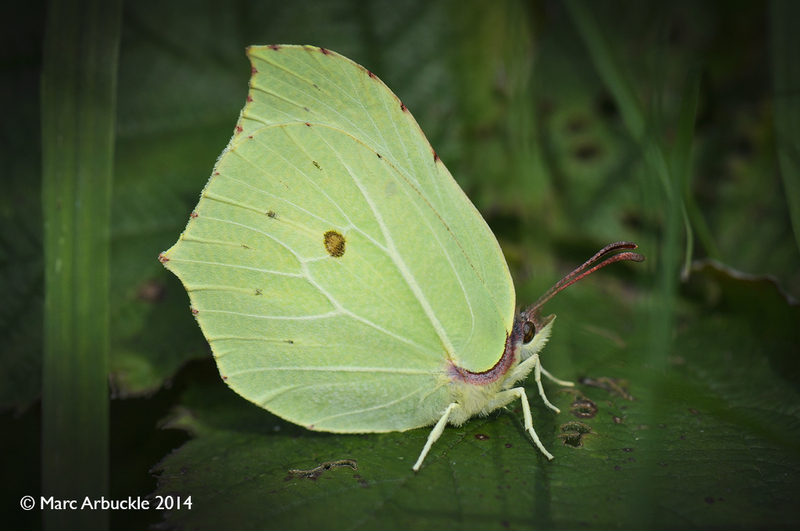 The Brimstone Gonepteryx rhamni is one of our longest-lived butterflies. Adults emerging in July that have successfully over-wintered can still be on the wing the following July, 12 months later. Males like the one pictured above usually awake from hibernation first, typically in the first warm, sunny days of March, a couple of weeks before the females. So if you spot a yellow butterfly at the moment, it’ll be a Brimstone. The sulphur yellow males are thought to be the original ‘butter-coloured fly’ and thus the source of the word ‘butter-fly’. The less conspicuous female is a much paler greenish-white in comparison. On the upperside, both sexes carry a distinctive single orange spot in the centre of each upper and lower wing, but these are tricky to see in flight. And this is a butterfly that never settles or feeds with its wings open. In fact on a dull day when perched amongst foliage, the veined and leaf-like scalloped wings blend with the leaves so convincingly that this can be an extremely hard insect to spot. Until that is it suddenly materialises in front of you like a splash of sunshine. This butterfly was the subject of one of the earliest hoaxes. Shortly before his death in 1702, an English butterfly collector, William Charlton, sent a male Brimstone, hand-painted with additional black spots and blue moons on the lower wings, to the esteemed entomologist James Petiver. In 1763, none other than the great Carl Linnaeus declared it a new species Papilio eclipses and included it in the 12th edition (1767) of his Systema Naturae. Thirty years later, in 1793, the Danish entomologist, John Christian Fabricius, examined it more closely and realised it was a fake. Allegedly, when the hoax was uncovered, the Keeper of National Curiosities at the British Museum was so annoyed he ‘indignantly stamped the specimen to pieces’. So the two specimens in the collection of the Linnean Society in London may actually be later replicas. Fake fakes if you will.